I mentioned the other day that I was getting my very own DNA test kit (it was a gift). 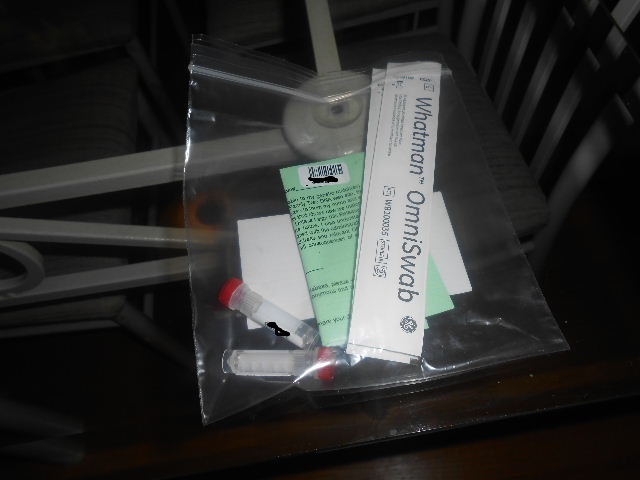 Today, my kit came and I couldn’t wait to do my swab. I’m eager like that. It includes two test swabs, two vials for the swab ends to placed in, and a consent form. All this will be placed into a mailer and sent off to the secret labs at FTDNA (okay, maybe not so secret). I got everything ready. I had a timer set up on my tablet so I could count the 60 seconds. Then, I washed my hands and began swabbing. I was a little leery about the scraper, but the word “scraper” is a misnomer. It’s very, very soft. Not like a soft toothbrush, but like cotton ball soft. I did a full minute of rubbing with the scraper. Then, it was time to put the scraper in the vial. If you have arthritis in your hands you know that dexterity isn’t your number one quality. I got the lid off the vial and had an “oh crap” moment. You put the scraper end that you use for the DNA sample into the vial and press the end of the scraper. It’s supposed to pop off into the vial. Mine didn’t at first. It took a couple of tries, but eventually the fingers figured out what they were supposed to do. Since it’s already 9pm and I haven’t had dinner, I’ll wait until tomorrow to do the second sample. Then, it’s off to the post office it goes. That’s great! I had the Family Finder test done a few years ago, it was a gift from a cousin also. It’s been such a help in my research! I was able to confirm a few lines that I strongly suspected but the paper trail was fuzzy or lacking.